Earthworks was completed in early 2017! An Enigmatic Ridgetop Enclosure. Glenford Fort Earthworks is a ridgetop ceremonial enclosure built by the Hopewell American Indian Culture 2,000 years ago. Its walls, still nearly intact, are made entirely of stacked stone and encircle the bluffs of a flat topped ridge. The property boasts a handsome and healthy Appalachian hillside of oaks and hickories that is studded with beautiful fern covered sandstone boulders. 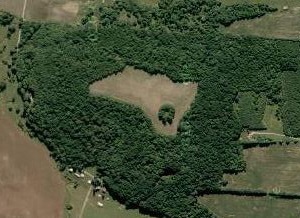 Located in Perry County near Buckeye Lake, the earthworks belong to a geographic and cultural ceremonial region shared with Newark Earthworks and Flint Ridge. To our knowledge, only 14 ridgetop enclosures were ever built in the Hopewell heartland of Ohio, and almost nowhere else. We now have the opportunity to help Glenford Fort become the ninth ridgetop Hopewell enclosure to be saved in the state. Glenford’s Notable Features. The walls that encircle the 24.4 acre ceremonial grounds average 20 feet in breadth and 3 to 6 feet in height. In earlier years the ridgetop’s most arresting feature was a stately stone mound that rose from the interior enclosure, its footprint still marked by a canopy of trees. Still highly visible is a squircle enclosure (rounded off square) that sits directly in front of the main gateway, and a small mound in front of the squircle. Aging the Enclosure. A 1987 excavation of the mound uncovered a collection of Adena spear points, potsherds, a copper bracelet, and pipe fragments. Evidence of postholes revealed the existence of an oval building at the base of the stone mound. Radiocarbon dating placed the structure’s age at 280 B.C., near the end of the Adena era, indicating that the mound was likely several centuries older than the stone wall and the squircle enclosure which are of classic Hopewell design. Since most archeologists now consider the Hopewell to be the cultural descendents of the Adena in Ohio, it is not necessarily surprising to have both cultures in evidence at one site. Master plan. 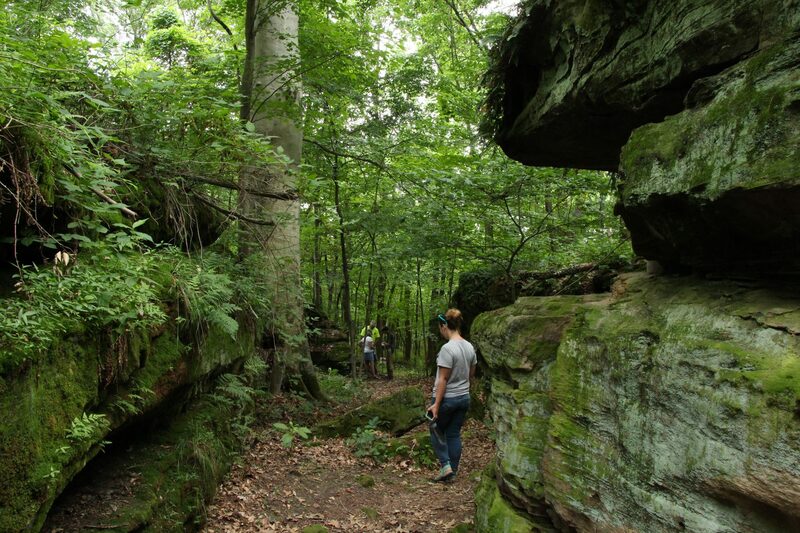 The Arc plans to fund the 65 acre tract which includes a section of the wall, a natural and dramatic cleft in the exposed bedrock that serves as the main gateway, and half of a square mound that once stood in front of the main entrance and now spans the boundary of the property. Perry County Soil & Water District will be the long term owner and manager of the property and the Arc will hold a conservation easement on the property.